qualification for applying for Constable Posts is candidates should have passed in 10+2 and 11th pass for Delhi police wards. Interested and eligible candidates can apply for these posts through offline mode only. The official website of Tripura is www.tripurapolice.gov.in. Eligible candidates can go through the official website for applying Tripura constable posts. The last date for submission of application form through offline mode is 05-12-2018. The candidates will be shortlisted based on their performance in written test and Physical test. 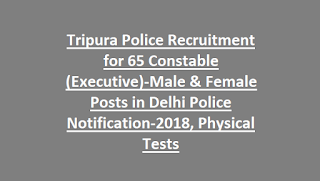 For other details of age limit, salary, physical standards tests, physical endurance/efficiency tests details, available vacancies and how to apply are given below for the Tripura Police Constable (Executive) male & female posts in Delhi Police Recruitment Notification 2018. 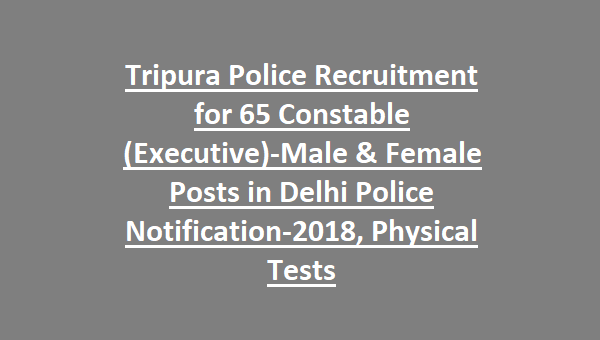 There are totally 65 available vacancies for Tripura Police Constable Male & female posts. As on 1-07-2018 the age limit for the male candidates is in between 18 – 21 years and female UR is 18 - 25 years. For SC/ST candidates the upper age limit is 26 years and female SC/ST is 30 years. The education qualification for applying for Constable Posts is candidates should have passed in 10+2 and 11th pass for Delhi police wards. The salary offered for the selected candidates is Rs.5200 – 20200/- with Grade Pay of Rs.2000/-. Candidates can refer in the Official notification for application fee. The candidates will be shortlisted based on merit in written examination and physical tests. Candidates can refer in the official notification for the exam pattern and syllabus. Interested candidates can apply for the Tripura Police Constable posts through offline mode only. Candidates can download the application form from the official website of Tripura is www.tripurapolice.gov.in before 30-10-2018. After downloading the application form candidates fill the application form with necessary information and send the form to the address of Deputy Commissioner of Police, Chairman Recruitment Board, Camp Office, A.D Nagar Police Line, PO A.D Nagar Pin-799003, Tripura. Candidates can receive the admit card before 05-12-2018.